I haven't blogged much lately because there just hasn't been a lot to report. We are back into just the normal day to day. We had a quiet weekend. We woke up Saturday morning to a dusting of snow. 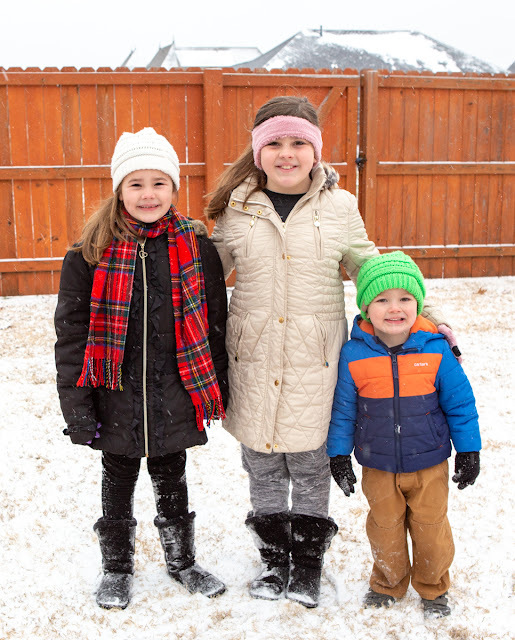 We haven't had any snow in probably 5 years so my kids were thrilled. It really wasn't even enough to play in but they had dressed themselves right after breakfast and ran out to play. It was SOOOO cold. I had something to go to Saturday night but everything got cancelled. So I took advantage and spent the entire day in my pj's cleaning out my closet. I have needed to do that for years and I did a BIG purge. It looks so much better. It had just overwhelmed and depressed me for a while. My house is usually fairly clean but that closet has just haunted me. I could never find anything and it was just a disaster. It felt good to get that done. They cancelled our Sunday school on Sunday so we just had church. We went and ate lunch with the Ormons and then that afternoon the kids had choir and GA'.s Sarah Kate came home with us and spent the night. The girls stayed up until midnight watching "When Calls the Heart". My girls are obsessed. We haven't been to our children's museum in a long time so we decided to go Monday since we were out of school. Of course so did every other kid in NWA. It was kind of a madhouse but we had a good time. It was a good way to spend an afternoon. When we left we found a new bird statue that we had to get a picture in front of. The kids made a you tube video of our visit! The girls were back in school today and WH and I went to Bible Study at church and then ate lunch with Laurie. I texted Laurie this picture because WH was so mad at dinner because we wouldn't let him have any more ranch dressing on his plate. You would have to know how much Laurie HATES ranch dressing. I told her this is her face when someone tries to give her ranch dressing. ha!